As money bail is being challenged nationally, an alarming "alternative" is being implemented in its place -- system supervision and preventative detention. But in Santa Clara County, a third option is developing -- community driven pretrial justice. Here's how it works. As money bail is being challenged across the country through litigation and legislation, there is a rising threat of what lawmakers are propping up to take its place — racially biased risk-assessments, electronic monitoring, and automatic pretrial detention. This “alternative” to money bail would result in the same caging and control of black, brown, and low-income communities, just without the cover of the money bail scheme. California’s bail reform story illustrates how the future of pretrial justice is presented as this choice between the lesser of two evils. On one hand, legislators voted in a version of SB10 which took a call for authentic bail reform and morphed it into a preventative detention and net-widening system codifying racially biased risk-assessment tools, and threatening to increase incarceration by circumventing due process. Meanwhile, the bail bond industry, finding themselves facing extinction as the country wakes up to the destruction of their exploitative industry, has put up a referendum to stop SB10 — which would leave the state with the status quo if passed. 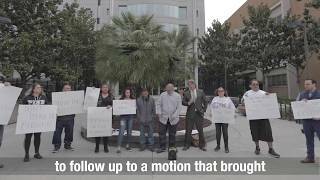 In Santa Clara County, in collaboration with Civil Rights Corps, we are trying new models of pretrial justice that refuses to accept the binary of money bail or system control. And it is not judges, politicians, or law enforcement who are carving out this third lane — it is the community. While the starting point should be automatic release — giving people court dates instead of detaining them — the approach we are taking in Santa Clara is how community can intervene, disrupt, and create pathways to freedom for those who the current system has locked up. The capacity of community to change the outcome of bail decisions at various points such as arraignment and bail hearings is tied directly to partnership with proactive public defenders who can both create the openings for community voice, as well as lift up the value of their inclusion. In Santa Clara Coutny, we have a pretrial detention rate of 75%. But, we also have a community and public defender office that is working to show those unconscionable numbers can be challenged through new initiatives. Here is how it works at arraignment and bail hearings. Our De-Bug organizers show up as a team at every felony arraignment. This is the arraignment for those who have been held since their arrest, and are on a trajectory of continued confinement largely due to the severity of the charge. 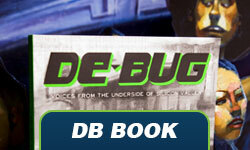 Before De-Bug and the defender office started our collaborative intervention, the courts worked with callous speed. Within a couple minutes of a defendant’s name being called, the judge would maintain the out-of-reach bail schedule, or possibly even declare the person ineligible for bail release based on charges and/or the assessment. Normally, a public defender, who has not been able to visit with the person facing charges until the start of the hearing, would have next to nothing to argue for release that is personalized to their client. This is what leads to the speedy conveyer belt-like rhythm of felony arraignment court. The defender would call out the case line number of their client, read the name, a quick scan of the case file and ask for a bail reduction or a non-monetary release. The judge would ask the prosecutor what they think, and the prosecutor would use the charge or the pretrial assessment to argue for keeping the bail amount where it was. The judge, given very little individualized information about the person beyond the rap sheet, would keep the bail as scheduled, or even move the case posture to “no bail.” This happens through the course of the roughly 20-40 cases heard on every felony arraignment calendar everyday. This is how Santa Clara County has a jail population that is three quarters filled by people being held in pretrial detention, meaning they haven’t been convicted of a crime, and are legally innocent. 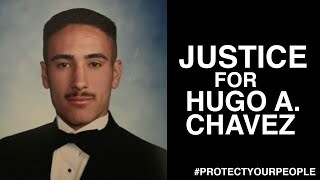 Meanwhile, the courtroom is filled with family and friends of those being held, watching their loved one marched into court in handcuffs, hearing their name get called, then seeing them go back into holding. Community members walk out of the court, unsure of what just happened, and feeling like the bail bond company is the only option. After court watching this process in felony court for months, seeing this same rerun, we decided to expand our “court watch” activities to “court doing” tactics — to not just observe, but to actively intervene and disrupt this machinery of detention. 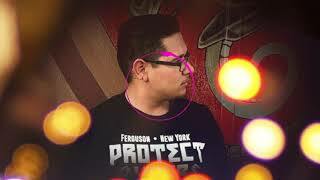 This is an expression of our participatory defense impulses for community to impact the court. We developed a community support identifying form with the public defender’s office who was also anxious to advocate for immediate release. The form is designed for those filling the courtroom pews, who want their support of their loved one facing charges to have value, a rightful place in the deliberation. The form asks them — someone’s aunt, friend, child, organization advocate — more about who their loved one is, the various ways they are part of this community, what’s at stake for them and others with another day of confinement, and also what roles they see themselves playing to assist that person in getting to court. Someone will say, “They can stay at my house,” or “I will give them a ride if they need it,” or explain how the person detained is who is responsible for taking the kids to school. At the beginning of the arraignment court hearing, the public defender, or a De-Bug organizer, will make an announcement to the audience that if they are here for someone detained, De-Bug folks are in the back of court and they can assist in understanding what the court hearing is about, and how community presence here can impact the outcome of the bail decision. De-Bug organizers then sit with community members in the hallway, filling out the form. They also gather information that counters and gives context to the risk-assessments conclusions — like giving an explanation that the previous Failure to Appear was due to the family moving and missing mail or that they went to court, but on the wrong day. These are very different realities than a presumed fleeing from the court — a distinction the algorithm doesn’t distinguish. The completed form is then given to the public defender, who now has something substantive and personalized to argue for a bail reduction or pretrial release. When they call the line number, the defender asks those in attendance for their client to stand or come up, and the defender shares what they learned through the form in a narrative that gives a much more complete picture of who someone is beyond an algorithmic conclusion, and they argue for release. A fundamental fallacy that often directs judges’ decisions to detain or keep high bail is their assumptions that people are alone in the world, and lack the supports that can remind them of court, or assist them in the issues that life presents that sometimes makes getting to court more difficult. This is countered through the re-articulation of someone as a community member. And in those situations where a person doesn’t have family or friends that show up at arraignment, or as a supplement to the already existing community ties, De-Bug offers up the Community Release Project. These are navigators that can connect people with housing, employment, and other resources once out. So if the judge feels the person is less likely to show up at court because they don’t have stable housing, or feels more confident in their appearance if they are participating in some programming - the Community Release Project Navigator can be a conduit to those support services, on top of the basic call reminders or rides to court. Those supported through the Community Release Project can also get automated text reminders of court and other related appointments (like participatory defense meetings) through Uptrust technology. In this way, the excuses a judge has to detain, or place on restrictive conditions, is stripped away by the lifting up and replacement of a community centered approach. The results of this reframing of pretrial justice has already proven effective, even while we attempt this in the backdrop of an entrenched court culture used to pretrial detention. In a comparative study, we looked at 100 cases before we started the Court Doing at arraignment, and there was an 85% rate of judges imposing the set bail schedules. 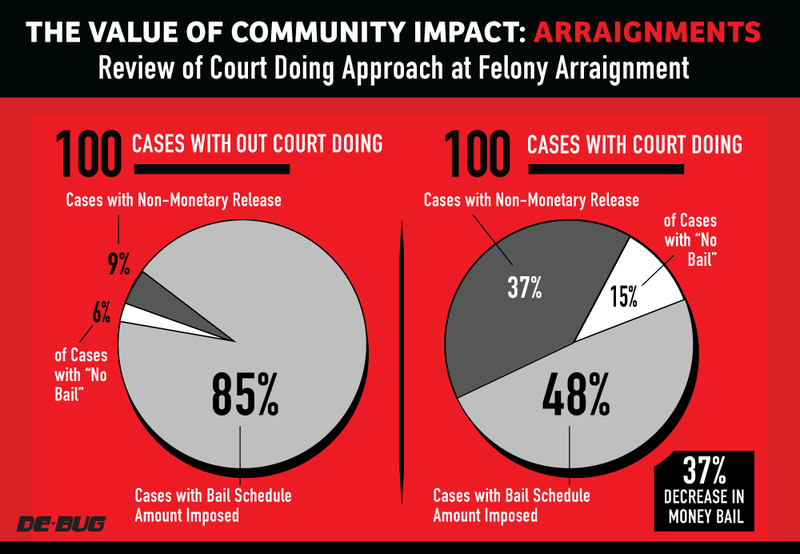 When we measured the impact of another 100 cases where we used the forms at arraignment, the reliance on the bail schedule dropped to 48%. The non-monetary release rate increased from 9% to 37% — four times the rate of people being released without having to pay money bail. But pretrial justice does not only mean the elimination of money bail, and the knee-jerk response by the courts to impose some measure of supervision was apparent in our findings. An overwhelming number of those who were given non-monetary release rather than money bail had some form of supervised conditions placed upon them. These range on a restriction spectrum — from calling into a Pretrial Officer every now and again during the court process, to the other end being electronic monitoring and home detention. While the vast majority of people were on the less-restrictive end, this arena of securing condition-free release, is the next stage of the battle for legitimate pretrial freedom. This is likely even more true outside of Santa Clara County, where many pretrial offices are housed within law enforcement agencies. So if the person is released at arraignment, we encourage them to come to a weekly participatory defense meeting to get continued support to work on their case — keeping a collective approach to fighting against a potential conviction. This is because charges don’t necessarily evaporate when people are released pretrial, and in some regards the greatest value of being released is being able to more fully engage in fighting the allegation. If the person does not get out, we work with the family and community support to prepare for the bail hearing. Santa Clara County public defenders have increased the number of bail hearing requests after an arraignment as part of their larger effort for pretrial justice. In preparation for the bail hearing, family and community employ participatory defense tactics — such as a social biography packet (a collection of letters, pictures, relevant documents) — particularly tailored to the decision-making arenas of the bail hearing. This is a packaged presentation of information that can counter a prosecutor or risk assessment’s arguments regarding making future court appearances and alleged public safety concerns. The social biography packet is given to the public defender who adds it as an exhibit in their bail motion. If there are needs that help make the case for release that is beyond the scope of the family — the defender and the Community Release Project coordinate to secure the programmatic support to strengthen the bail motion. In fact, every bail motion submitted to the courts has a description of the Community Release Project, and how the person can have access to its support. Together — family, public defender, Community Release Project Navigator — all prepare for and are present at the bail hearing. The Community Release Project support ranges. Sometimes it is establishing acceptance into a housing program in advance of the hearing; sometimes it is something literally as simple as letting the judge know the Community Release Project Navigator can pick the person up from jail and drive them to a family residence. By again collectivizing the approach, we change the odds of the outcome, and the likelihood of that person coming home is much higher. The impact of community in leading to pretrial freedom is just as evident at the bail hearing stage as it is at arraignment. In a review of the last 25 bail hearings in a 3 month period where we employed this participatory defense support, 19 cases had the bail amount significantly reduced, or turned into non-monetary release. 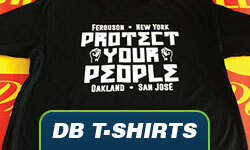 In fact, 12 of the cases went from the high bail schedule to non-monetary release. The average bail amounts of those cases were $155,222. One case went from $500,000 to non-monetary release. What was also very telling was what we observed from cases we supported that went into the bail hearing as “no bail” cases. This means that at arraignment, the judge went to the extraordinary measure of excluding the person from the right to bail — something that could become the norm under an SB10 preventative detention scheme. And yet at the bail hearings, three of the four cases that were initially deemed “no bail” cases became releases once the defender and community fought for freedom. 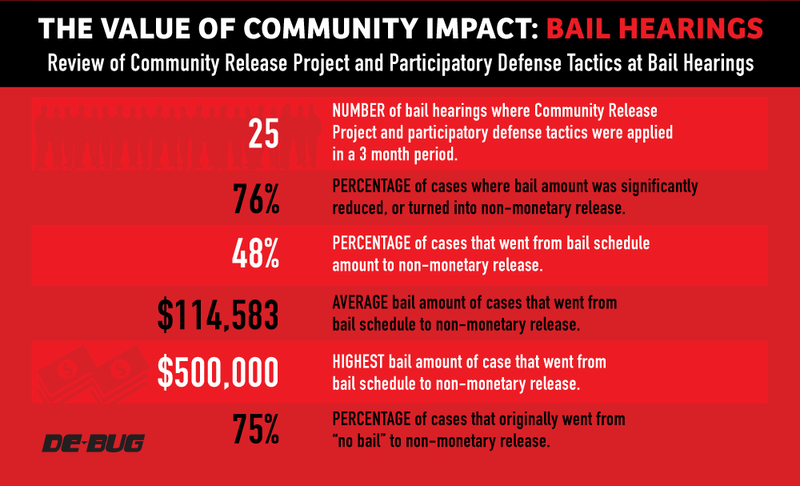 In total, through the participatory defense for the bail hearings, particularly the Community Release Project, the support resulted in a non-monetary release or significant bail reduction in 76% of all cases reviewed. The step back lessons from the bail hearings though is indicative of much more than the effectiveness of community intervention. What the ultimate securing of release at the bail hearing shows is that people are being held who could have been released from the very beginning of the process. While we celebrated the release at bail hearings — it means the person has been through a pre-arraignment review, another review at arraignment, and both judges rested on high bail amounts rather than release. And when presented with a full legal argument by a defender, bolstered by community information and release options — the court finally was convinced to release. Meanwhile, the person has lost weeks of their lives, irretrievable time that can result in permanent loss and damage. And those who ended up being released from a high bail or a no bail are now home pretrial after the bail hearing, attending their court dates, coming to participatory defense meetings, and working on fighting their cases through this community-centered approach. These are community members who would have had a very long time to stay detained waiting for trial, if they even were able to withstand the coercive pressure of taking a plea while incarcerated. While we are still at the beginning stages of our attempt to imagine and implement a community driven pretrial justice framework, what we do know is that we are not waiting for the legislators who voted in SB10, or the bail bond industry, to decide the fate of our communities’ future. 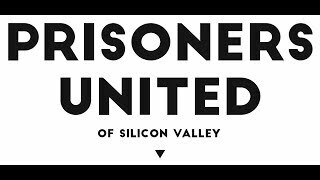 We believe the future of pretrial justice, as every expression of the struggle for justice, is to be determined by the community.